I wish that those who are trying to regulate the education process would teach some courses to begin to understand just how much work it really is. 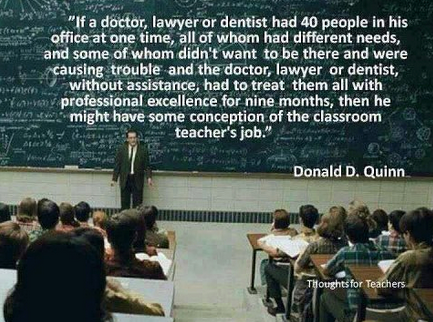 I guess this is a little bit of "now I get it" for my friends and family members who are teachers and have been doing it for a while. That post received 60+ likes, 1 share, and 9 significant comments. I keep thinking about this. First some background: As a librarian, I am always teaching. Sometimes it is small, short teachable moments (as a parent, also). Other times it is more formal and structured. I have taught as part of Boy Scout adult leader training (Wood Badge, Powder Horn, various other leader training). I have taught one-time presentations. In my current position, the last category has been the most common. A fair amount of the former has been material which was developed by others, and all I had to do was make the presentation, and answer the (inevitable) questions. Back in 2009, the State Library of Louisiana became one of the pilot agencies for the Library Support Staff Certification Program. (The certification is offered through the American Library Association-Allied Professional Association.) The first course we offered was Supervision and Management. The learning objective is the foundation for any learning event (any stage of learning) in my opinion. It becomes a constant beacon by which you determine what content to share. I'm a fan of the "performance objective" personally. Not so much answering what the learner will learn, but what the learner will be able to DO or achieve as a result of the learning. This course, unlike Reference Services, or even Supervision and Management, does not really have a "DO" aspect to it. It feels mostly like a KNOW class. And that may be why I have been struggling. I feel your pain (and sometimes joy!). I'm happy to be no longer involved in teaching, but I miss the joy of having someone "get it" all of a sudden, especially when it's someone you thought would never get it! Trying to segment learning experiences meaningfully, especially online, so that all the dots are connected by the end of the semester is a challenge, but as a practitioner, you get to weave together the theoretical stuff with the practical stuff, and that is what most students see as the most valuable learning they get. There is both the joy of seeing someone "get it" as well as the pleasure of building a relationship. Unlike the students Tom was teaching, these courses are specifically aimed at people who are working in libraries, and (for the most part) are not going to go and get the Masters. These are the folks who really make a library run. I taught in both the technicians programme and the masters programme. Students are demanding, prep is critical. I adored teaching -- HATED marking . I send props out to anyone who teaches full time. That is the part that I dislike the most, the grading, the marking, the judging. I know I am told it is assessing and a way to judge how well I/we communicated the content. That does not mean that I have to enjoy it. I wrote all of that before starting. It was still a bit of a struggle, but I have now made it through the first two classes, and passed the baton (for a bit, and please pardon the pun) to the other instructor for a couple weeks. However, that does mean that the part I like the least - grading - is up for the one set of homework completed, and the next about to flood me. I am grateful for the positive feedback from those taking the course, many of whom have taken other courses I have taught. It has been an enlightening growth experience.